Is it bird or a sci-fi hybrid? When a soaring Short-toed Snake-Eagle spots a delicious snake, it swoops down, grabs it with its talons, then tears off the snake’s head. Still on the wing, it swallows the entire snake, head first. Smaller than Bald Eagles, they live mainly in Africa and have legs and toes covered in thick scales to protect them from bites. Snake-Eagles take on some of the swiftest and deadliest snakes in the world, like cobras and black mambas. Be sure to view the large version of the photo! This show made possible by Jim and Birte Falconer of Seattle, and Idie Ulsh, helping public radio tell stories about science and nature. That name — “snake-eagle” — may conjure up some kind of fearsome sci-fi hybrid, spawned in a secret laboratory. But snake-eagles are for real. And they are awesome, big birds of prey. When a soaring snake-eagle spots a delicious snake, it swoops down suddenly, grabbing with its talons. Then it immediately flies upward, as the snake writhes and strikes. The first order of business is to minimize the danger, so the eagle crushes or tears off the snake’s head. Still on the wing, it then swallows the entire snake, head first. Snake-eagles are a bit smaller than Bald Eagles. There are six different species. And they live mainly in Africa, although one ranges as far as Europe and India. Snake-eagle legs and toes are covered in thick scales that help protect them from bites. 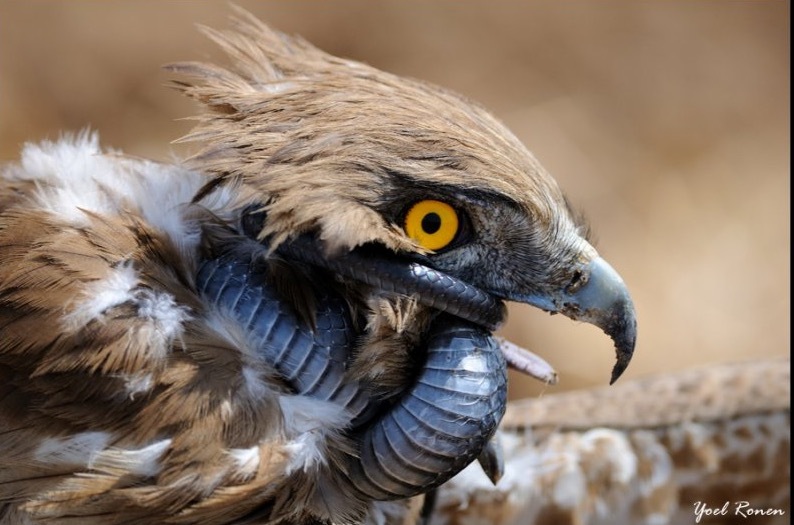 And bites are a serious risk: snake-eagles take on some of the swiftest and deadliest snakes in the world, like cobras and black mambas. But not every meal is a battle with a deadly adversary. When not snatching snakes, snake-eagles may also hunt lizards, rodents, and even bats or fish. Bird sounds provided by XENO CANTO 366048 recorded by Marco Dragonetti and XC240492 recorded by Jarek Matusiak.